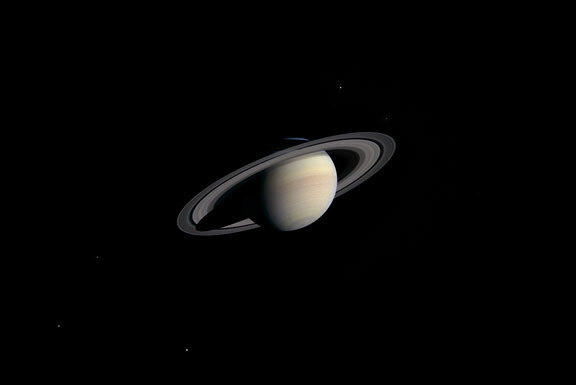 A natural color composite of the image is available from the Cassini Imaging Team's website at http://ciclops.org and from NASA's Jet Propulsion Laboratory, Pasadena, Calif., at http://photojournal.jpl.nasa.gov/catalog/. Dr. Carolyn Porco, a planetary ring specialist and leader of the Imaging Science team, said, "For someone who was involved in the Voyager exploration of Saturn twenty-three years ago, this is turning out to be a very sentimental journey. I'm reminded of what it felt like to see Saturn's rings for the first time with Voyager, and how rich and surprising they were. The spokes in the B ring, the twisted F ring and its shepherding moons, the sheer number and diversity of ring features.... we'll be on the lookout for all these things and more over the next few months". Mission information is available online at http://saturn.jpl.nasa.gov .